1 of 2 In a medium bowl, whisk 2 eggs, 1 cup skim milk, 1/2 tsp almond extract, 1/2 cup cornstarch, 1/2 cup flour, 1 tbsp oil, 2 tsp sugar, 3/4 tsp baking powder, 1/4 tsp salt and a pinch ground allspice. Refrigerate 20 minutes. Stir. 2 of 2 Heat an 8-inch nonstick skillet over medium-high heat until hot. With a ladle or 1/4-cup measure, add 2 tbsp batter to skillet. Tilt and rotate pan to coat. Cook 30 seconds or until crepe is browned on bottom and edges are dry. Lift with a silicone spatula and flip over. Cook 5 seconds, then transfer to a sheet of wax paper. Repeat with remaining batter, stacking crepes with wax paper in between. 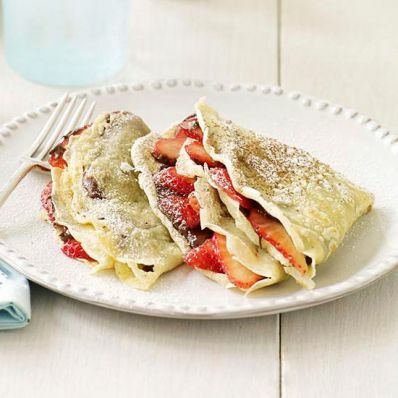 Spread with Nutella and scatter sliced strawberries on top. Fold, then dust with confectioners' sugar and cocoa powder.